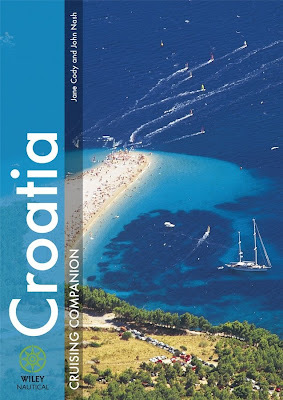 Croatia Online ©: Croatia Online - Ideal Christmas Present For Croatia Lovers! Croatia Online - Ideal Christmas Present For Croatia Lovers! Apologies for hijacking Croatia Online, a normally highly objective and independent site, with some shameless self promotion in mind! It continues to feature regularly in Amazon's top ten for books on Croatia, both in the UK and USA, and seems to be a snip at the prices currently offered by Amazon. Whilst it's primarily aimed at sailors, land lubbers will find a whole host of information on the more remote island destinations, and mainland villages, that isn't available elsewhere - it might even persuade you to take to the water which is one of the best ways to explore the real Dalmatia.Whatever your preferences, enjoy the real Dalmatia before everyone discovers it! We took over three years to research and write it, and things are changing so fast in Croatia that we spent another few months revisiting locations that we covered at the beginning to ensure they were up to date. Plenty of blood sweat and tears along the way but we've come to be quite proud of the end result and have been very gratified by the positive feedback we have received as well as being spurred on to newer heights for the second edition, by the updates and constructive criticism that is an essential part of a "living work" such as Dalmatia's coastline and islands. We picked up our car and bona fide MOT certificate this morning. After the stresses of the previous day, in the clutches of the powerful forces of a "main dealership", serendipity was at work. Yesterday,the garage we removed our car to, was the subject of a random inspection from VOSA, the organisation that monitors MOT standards. Needless to say, the subject was fully discussed,the position endorsed, and the VOSA inspector offered to accompany us to the first garage and give them 15 points for each headlamp which is, apparently, quite a severe penalty for MOT operators!